Actress, director, producer, teacher, activist – this is how Olympia Dukakis defines herself. The Academy Award and Golden Globe-winning star of such films as Moonstruck, Steel Magnolias, Picture Perfect and the top rated mini-series Tales of the City, Olympia Dukakis is a woman of uncommon achievement and dedication. A 30 year veteran of stage and screen, she also founded and served as artistic director of New Jersey’s whole theater for 19 years, and sits on the boards of several influential arts organizations. Believing deeply in social activism, she is a leading advocate for women’s rights and environmental concerns. In an effort to combine these beliefs with her art, Dukakis launched “Voices of Earth,” a theater project featuring four actresses who explore the relationship between women and “Mother Earth” from an historical perspective. Rooted in this social commitment, her lecture presentation looks at life as a journey of growth and possibility, and includes dramatic readings that showcase her remarkable talent. Whether addressing the richness of life after 50, the immigrant experience in America or the thought-provoking relationship between maternal and environmental concerns, her moving performances inspire audiences to reach for new and exciting heights. Do you want to hire Olympia Dukakis? Directly request a quote. 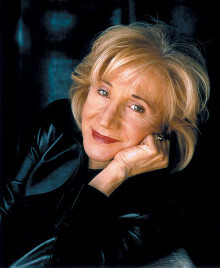 In 48 hours we can send you the availability of Olympia Dukakis If you would like to book Olympia Dukakis, Entertainment Booking Agency is the right place. We will offer you the best price and contact the management or we directly contact Olympia Dukakis. For corporate appearances or speaking engagements you can contact our agents and the will help you true the process. Tags: hire Olympia Dukakis, Olympia Dukakis booking, book Olympia Dukakis, Olympia Dukakis appearances, find more information on booking Olympia Dukakis for appearances, Olympia Dukakis speaking engagements, Olympia Dukakis endorsements/spokesperson, Olympia Dukakis appearance fees, Olympia Dukakis booking agency contact info, biography of Olympia Dukakis, Contact an artist booking talent agent find a speakers bureau that can book Olympia Dukakis, speaker booking agency for Olympia Dukakis, Olympia Dukakis booking agency, Olympia Dukakis booking for corporate event. EBA is one of the biggest entertainment booking agencies in the World. We book hundreds of celebrities, artist, athletes and speakers in a year. Important to know is that we are not claiming to be the management of Olympia Dukakis. We are not the official agent for Olympia Dukakis. Companies from around the globe book these artists and speakers true our company be course we have one of the biggest networks and we always have direct contact with the artist or the management. We help you to find the right celebrities for your corporate of private events. Please contact one of our agents to get free advice and we will help to get the world-famous artist on your party.